I love running with other people, especially people that are faster than I am and can push me a little harder than I would go if I was just running by myself. I woke up yesterday with clear sinuses and to celebrate, I decided to go run one of my favorite trails in San Diego, the San Elijo Lagoon trail. After watching the sunrise, I sent an email to my running friends to see if anyone wanted to join me in a few hours for a nice, easy trail run. Jeff responded almost immediately that he was going to run that same trail today and would join me. Jeff is great to run with; he has all kinds of stories and running knowledge. He's fast, too. He runs a 1:20 half marathon and usually places in the 46-50 age group, so it's good running with him; he always pushes me and talks the whole way as I gasp for breath and try to find some way to keep up. Yesterday was no exception. 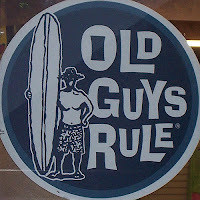 He shows up with an "Old Guys Rule" t-shirt and board shorts and later in the run I decided he chose said ensemble just to taunt me as I spent about 45 minutes staring at the back of it. He shows up and says we can run easy or hard and I told him I preferred easy, so he sets out at about a 7 min./mile pace and gets faster after he warms up. The great thing about running with Jeff is that I tell him that I don't want to hold him back and he can take off if he wants, so he speeds up a little bit, but he keeps talking, so you really only have two choices, either to speed up and continue the one-sided conversation punctuated by the occasional grunt on my part, or to slow down and rudely cut off the conversation, and if nothing else, I am polite, so I suffered through the 6 1/2 miler and hopefully I am better for it. So, this morning I woke up and decided to reward myself with an easier solo run, something short and slow, because I like to have a few easy days after a hard day and yesterday was definitely a hard day. I woke up and was surprised because there were some clouds in the sky and there was some wind, the ground was actually holding some moisture from the night before, and it was cold. I love running in tough conditions, especially wet, windy, cold days. I haven't run in snow yet, so I don't know if I would like that, but I am doing the Slowtwitch 100/100 challenge and I have felt like quite a wimp, because although I have not skipped a day in the challenge, the conditions I have dealt with have been near-perfect and I read the posts of others around the country who are also doing the challenge, and doing it in much harder conditions, so today I was going to go out, put on my wool socks and beanie, break out a long-sleeve shirt and really suffer in the sub-50 degree winter. I didn't grow this winter running beard for nothing. Last week's weather - I don't know what everyone is complaining about; winter is awesome. I headed out the door and the wind was pretty strong, but I felt good and hit one of my favorite little trails, and even though I wore a long-sleeve running shirt, it was a little thin and I felt cold. Sweet, I am strong and I will suffer. Unfortunately at around 2 miles into the run, the sun broke through, the temps shot up and I started to overheat. Curse you, sun, I even had to take off my beanie. My wool socks - jealous? My wife and what she wears when we drop below 60 (yes, her hands are resting on a 20 lb. roast and yes, the butcher gave her a 50% hotness discount).